When Facebook recently introduced the ability to post from a Facebook page to a connected Instagram business account, many marketers got excited about the possibilities. With this new Facebook functionality, there’s no need for a third-party tool, which can alleviate financial implications for some small businesses. There are also situations where you want to post the same content to both Instagram and Facebook and the ability to do so simultaneously can save time and reduce workload. This feature allows you to simply add Instagram as a posting option with the Facebook post you’re creating, automatically pushing the post to Instagram when you publish it. For as long as Instagram has been around, users—especially marketers—have wanted the option to upload to Instagram via the desktop. We often have files saved on our computers for photos and visual content, making it easier to upload the content directly from the desktop rather than having to transfer the content to a mobile device first. Designed as a mobile app, Instagram has always restricted the ways in which content can be uploaded to the app. The integration of third-party tools like Agorapulse, Iconosquare, Tailwind, and Hootsuite alleviated this frustration, allowing you to upload content via desktop and schedule the content for later posting times. Due to API constraints, however, there are still plenty of limitations to the content that can be uploaded via external tools. Now let’s look at how to cross-post from Facebook to Instagram on your desktop. 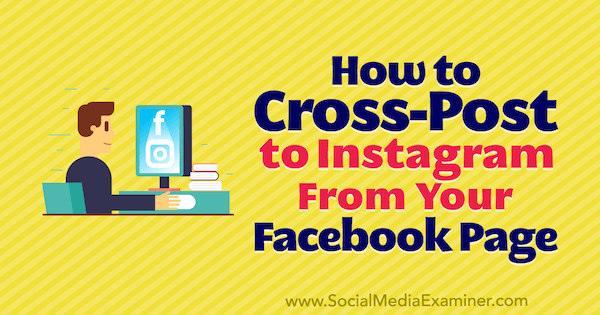 To take advantage of the cross-posting functionality, you must have an Instagram business profile that’s connected to a Facebook page you have access to. The new cross-posting functionality is rolling out to Facebook pages now. 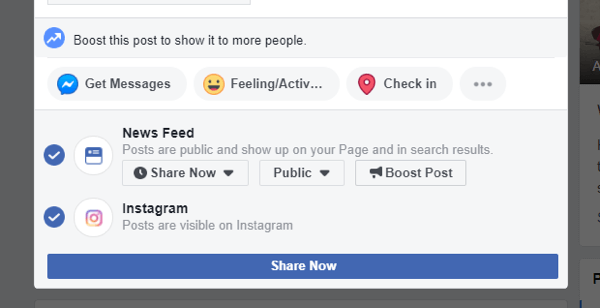 If you have the feature, you’ll see the Instagram post option at the bottom of the post creation screen when you start a new post on your Facebook page. Warning: If you have two-factor authentication enabled on your Instagram account, you won’t be able to use the Facebook cross-posting option. You’ll receive a warning of this if two-factor authentication is enabled. You have to disable the two-factor authentication on your Instagram account to continue. If you plan to regularly cross-post from Facebook, you might want to consider leaving two-factor authentication disabled. But beware of the security risks associated with this choice. To get started, write your post content and upload your visual. You’ll need to include a photo to enable the Instagram share option. You can create an Instagram shareable post if it includes a single photo. You can’t currently share a post to Instagram from Facebook if it includes multiple images or a video. These restrictions apply to many dashboard tools as well because they’re governed by the API restrictions Instagram places on the upload process. There are no significant restrictions to the photo size you can upload to Instagram via Facebook. Because Instagram supports square, vertical, and horizontal images, images of any orientation can be uploaded to Instagram. However, Instagram won’t support a vertical photo taller than a 4:3 ratio. If you upload a photo with dimensions taller than that ratio, your photo will be cropped on Instagram. The post caption will be the same on both Instagram and Facebook, so be mindful of how you write your caption on Facebook. Include the hashtags in the Facebook post when you write it. 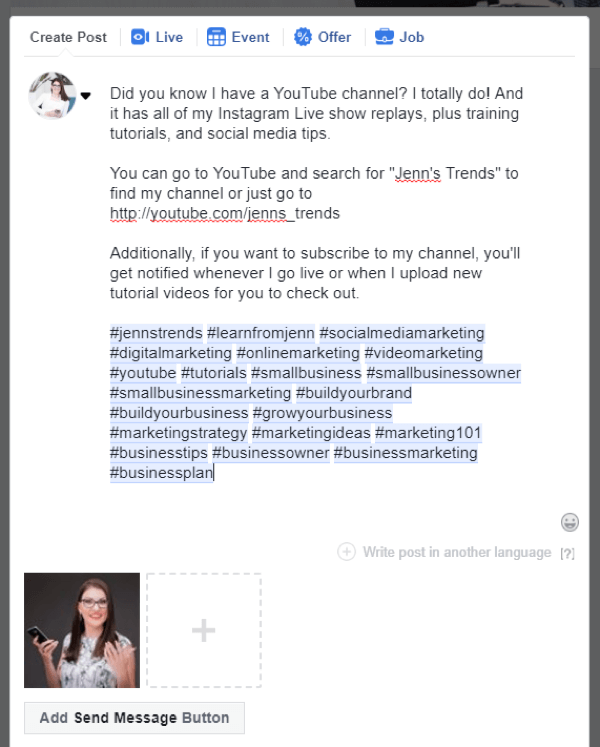 Add the hashtags to the Instagram post caption after it’s shared to Instagram by editing the post. Add the hashtags to a comment on your Instagram post after it’s uploaded. In writing the caption above on Facebook, I included the hashtags I wanted to appear on the Instagram caption. I then edited the Facebook post immediately after publishing to delete the hashtags from the Facebook post. 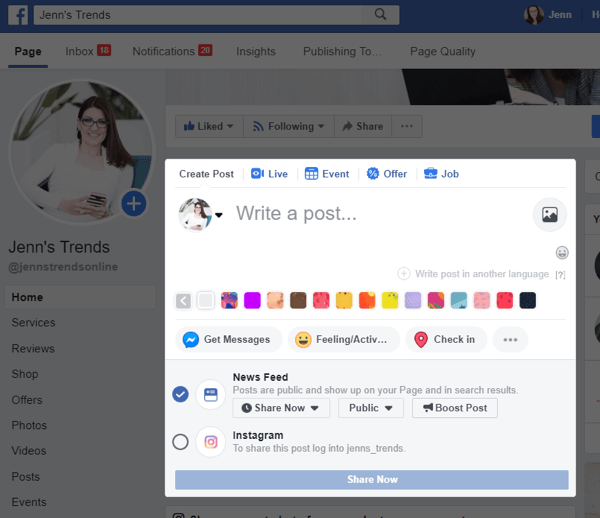 If you’re using this feature and are on Facebook to upload, it’s likely easier and more efficient for you to edit the Facebook post caption after posting rather than switching over to Instagram and editing your caption or adding a comment on that post. To enable Instagram sharing, click and select the Instagram option from the posting options. You’ll have to log into your Instagram account with your username and password. You only need to log in once on your device. Once you’ve logged into Instagram on that computer, you won’t need to log in again the next time you share a post to Instagram from that same Facebook page. 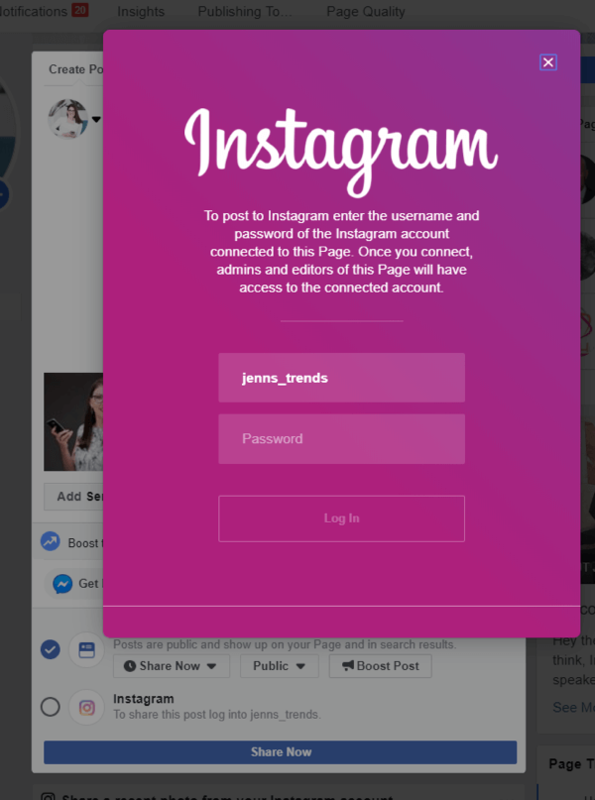 If you use a different Facebook page and Instagram account, or use a different computer to share from Facebook to Instagram, you’ll have to log in with your username and password again. Once you’ve successfully connected your Instagram account, you’ll see the Instagram option checked for the post share options. To utilize the cross-posting feature on Instagram, you must post both the Facebook and Instagram posts “now”. 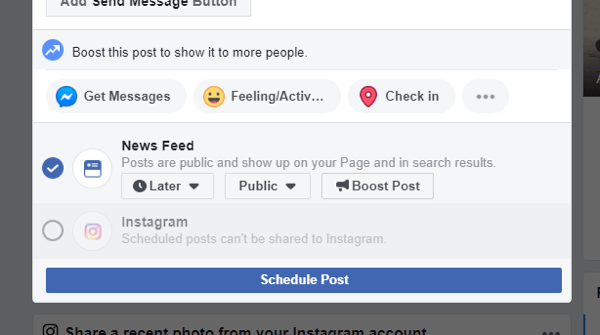 If you attempt to schedule the Facebook post for a later time, the option to share to Instagram is no longer available, as you can see below. Additionally, you must post to Facebook to allow the Instagram post to publish; you can’t select only the Instagram option. Once you’ve published the Facebook post, check your Instagram account and you’ll see the post you shared is now live on your profile. It will now begin to appear in the feeds of those who follow you. While there’s often speculation about and research into post reach on Facebook—in relation to how or where a post originated (organic to Facebook, shared from Instagram, or uploaded via a third-party tool)—there’s no data at this time to indicate that a post shared from Facebook to Instagram will have any better reach or higher rankings in the Instagram algorithm. The introduction of cross-posting from Facebook to Instagram on desktop is an appealing feature for marketers. The ability to minimize time and work by posting to both Facebook and Instagram simultaneously is tempting. However, it’s important to remember the restrictions currently associated with this feature. Like most things related to posting to Instagram from any other source, there are limitations to using your Facebook page to create an Instagram post. As mentioned above, you’re limited to having a single photo upload in the Facebook post and you must post to both Facebook and Instagram immediately; you can’t schedule a post for later or choose only the Instagram option. Additionally, you want to be cautious about always posting the same content to Facebook and Instagram. While the convenience of having them both post at the same time can be efficient for marketers, you run the risk of not attracting Instagram followers if you have the same content on both platforms. If potential customers find you on both Instagram and Facebook, and see you have the same content, they’ll often decide to follow you on only one platform. Also, remember that you often have different audiences on Instagram and Facebook. How you phrase or target content on your Facebook account may be different from your Instagram account. Having the same content pushed to both platforms may create a disconnect in your content with your audience on one or both platforms. Of course, you can always edit the text caption on either post after sharing it to update the verbiage or context to better match the audience. Similarly, Facebook allows you to include clickable links in the caption, but Instagram doesn’t. Typically, you’ll say something like “click on the link in the bio” on Instagram to direct people to a link or location. You’ll want to think about how you write those captions or edit them after posting so that both Instagram and Facebook have the right call to action included. Sharing to both Facebook and Instagram is handy, but you’re better off creating fresh content exclusively for Instagram that isn’t available anywhere else, increasing people’s interest in following both your Facebook and Instagram accounts. If you want to take advantage of using Facebook to post to Instagram from the desktop, you could post to Facebook and Instagram and then immediately delete the Facebook post from your page. This would alleviate the need for any third-party posting tool and allow you to use your Facebook page to create your content. Finally, the cross-posting functionality from Facebook to Instagram is available only for Facebook pages when using the desktop version of the site. The same functionality isn’t available when using the Facebook app or Facebook Pages app on your mobile device. Keep in mind that this feature may become more supportive of sharing options as it’s used more consistently. Until then, take advantage of it when it makes sense for your business and continue to post to Instagram using the Instagram app or other third-party tools that offer the functionality you need. What do you think? Have you used the cross-posting tool? Are you going to give the feature a try after reading this? Please share your thoughts or tips in the comments below. Find out how to add alt text to Instagram posts. Learn how to write Instagram captions that improve engagement. Discover four tips to help you create better Instagram photos.